Codey Rocky is an educational coding robot for STEAM education for children ages 6+. 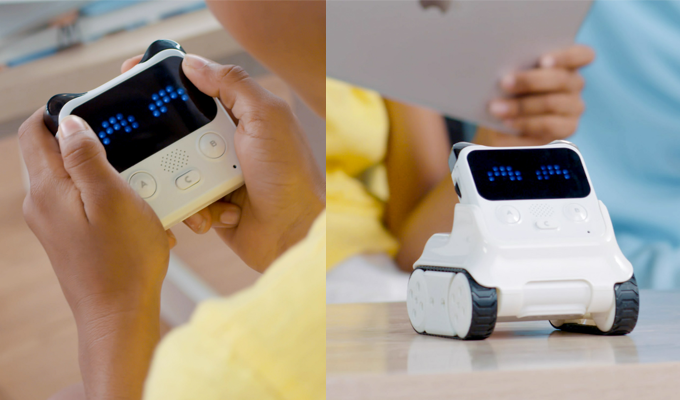 Codey Rocky is an entry-level coding robot for STEM education, suitable for children ages 6 and up. 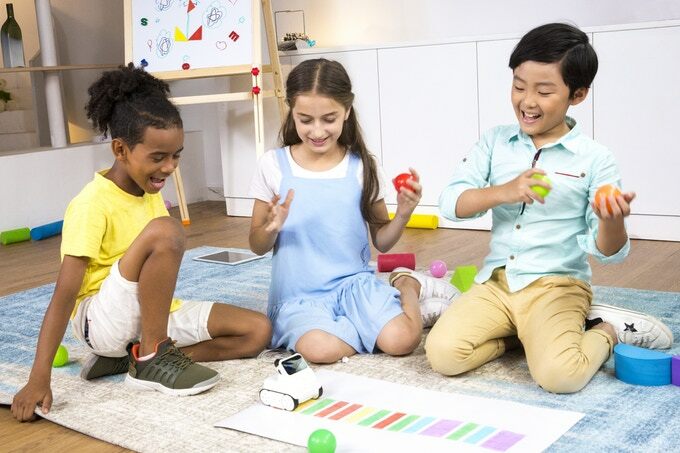 The combination of easy-to-use robotics hardware with graphical programming gives all children the opportunity to take their first steps into the world of code and compose their first “Hello World!” statement at the same time as they explore their creativity. Codey Rocky – The New Generation of Robots is Here! Codey is the detachable controller that holds all the magic. It includes more than 10 electronic modules that can be controlled via code. Rocky is the car that lets you take Codey anywhere you want, so that your clever programs can be run everywhere. Codey comes with a built-in 6-axis gyroscope so that you can control the games you code by moving or tilting your controller, and see the game respond to your actions. Included with Codey Rocky is more than 20 learning guides for getting started with graphical programming and Python code. Seamlessly progress from one challenge to another, until you are ready to take on the advanced Python language - and simply convert your code in one click. 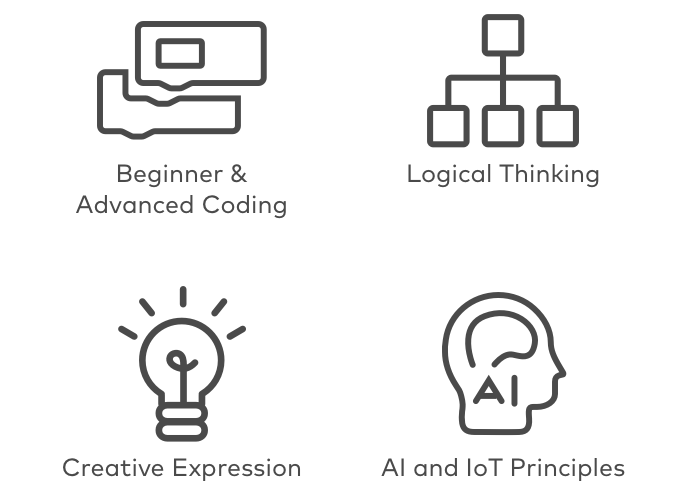 Create your first program by dragging and dropping code blocks and gradually gain more advanced skills, and transition into Python programming. Logic is the foundation of coding. Learn how to go from idea to working program by writing code that makes sense in practice. Code is the easiest way to make something, and Codey Rocky makes it even more fun and creative. Make your ideas real in mBlock 5 and see your coding companion run your code. From voice recognition to infrared TV controls, Codey Rocky users gain first familiarity with Artificial Intelligence and Internet of Things. 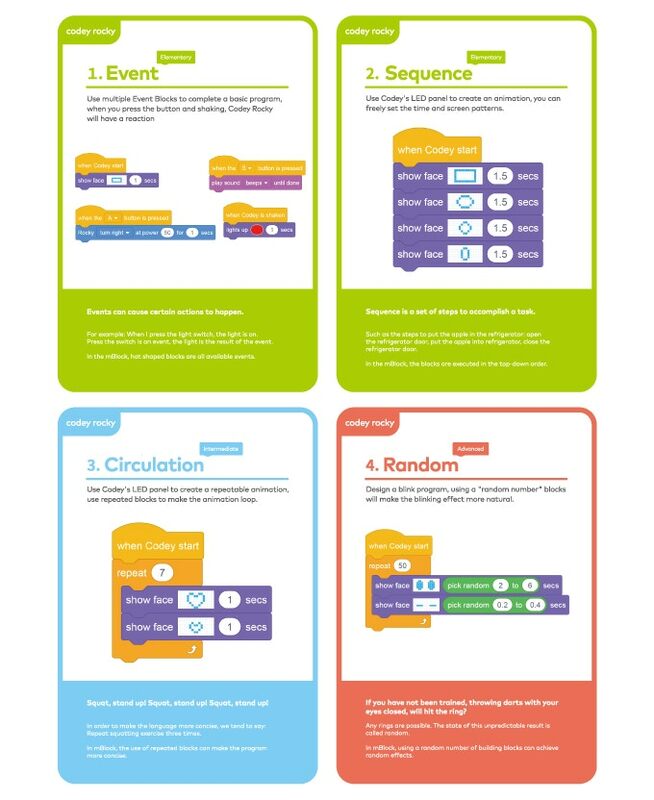 Makeblock’s mBlock 5 programming software is based on MIT’s graphical programming language Scratch 3.0 to guarantee that beginners can get started coding within minutes. All you need to do is drag and drop! 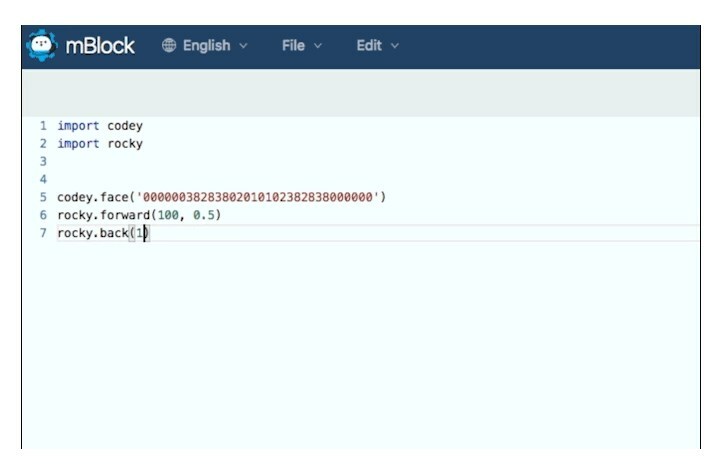 Regardless if you prefer to program on MacBook, Chromebook or desktop PC, mBlock 5 is ready for you to get started with code. With just one click you can turn your graphical code into Python code and continue learning an advanced and practical language. Use mBlock 5 to add Internet of Things-functionality to Codey Rocky. Control home appliances, get weather reports, and much more! mBlock 5 software supports AI-functionality including voice and face recognition, and mood sensing etc. With Codey Rocky, children have the most fun and easiest way of getting familiar with one of the fundamental technologies of the 21st century. Code to customize expression, to see time, weather, and personal messages shown on Codey's large LED display, bring your coding companion to life. Codey Rocky is designed to be compatible with Makeblock Neuron and LEGO® bricks, to let you realize any idea you can come up with. Pogo Pin on both Codey and Rocky for connection with Makeblock Neuron. The optional Bluetooth dongle lets you upload code to your robot companion wirelessly to computer so that you can rapidly try out your code ideas. Please mind that must use our bluetooth dongle for wireless upload to computer, without it you can also use USB cable for wired upload, and for connection with tablets you can use tablet's bluetooth directly. Rocky’s color and infrared sensors lets it recognize colors and follow the direction of lights that it senses. Write code to assign functions to Codey’s three buttons and gear knob to make your companion into a powerful musical instrument. Connect Codey Rocky to the internet and receive weather information, which can be displayed through Codey’s expressive LED display. Connect events with Internet of Things and If this, then that (IFTTT) to make your Codey Rocky a truly interactive robot. Have fun with AI functions in mBlock 5 software support. 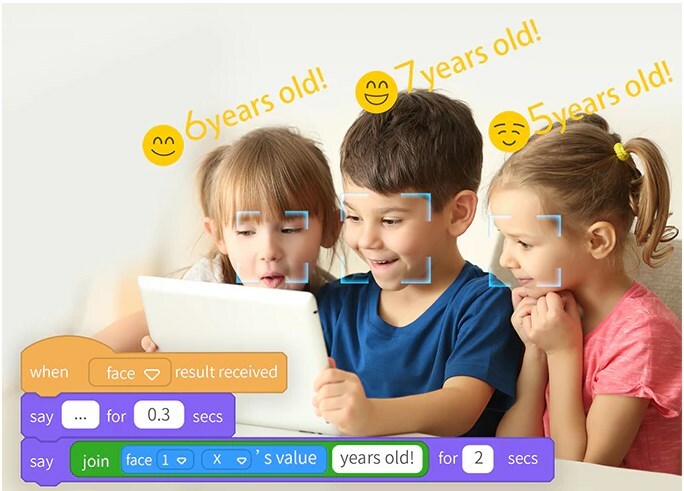 Code to make Codey Rocky recognize the ages of people by observing their faces. Know your Codey Rocky through its technical details. Note: This version does not include the MakeBlock Bluetooth Dongle; it needs to be purchased separately. THE CODEY UNIT HAS PLENTY OF USEFUL GIZMOS YOUR KIDS CAN CONTROL "As soon as you take him out the box, it’s apparent how cute Codey Rocky is. And yes, I’m calling him a ‘him’. The little dude has too much personality to be an ‘it’. MAKEBLOCK CODEY ROCKY CODING PROGRAMMING TOY FOR AGES 6 AND UP! "Whether you like learning with your ears or eyes, visual learning is easily the most practical way to process information by seeing it rather than hearing it. ‘it’. 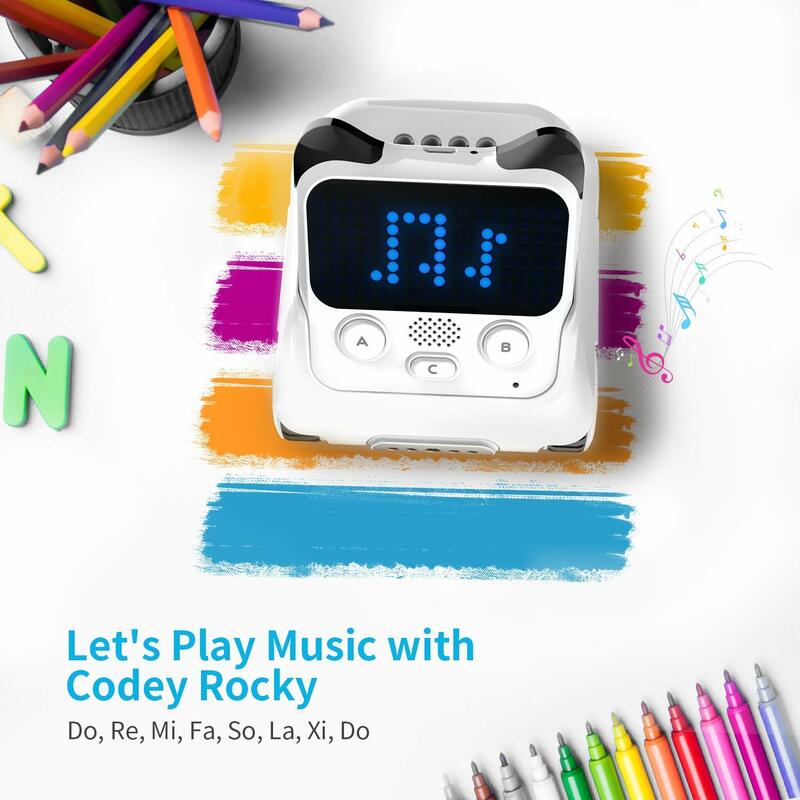 Codey Rocky – the coding robot and invention tool in one! 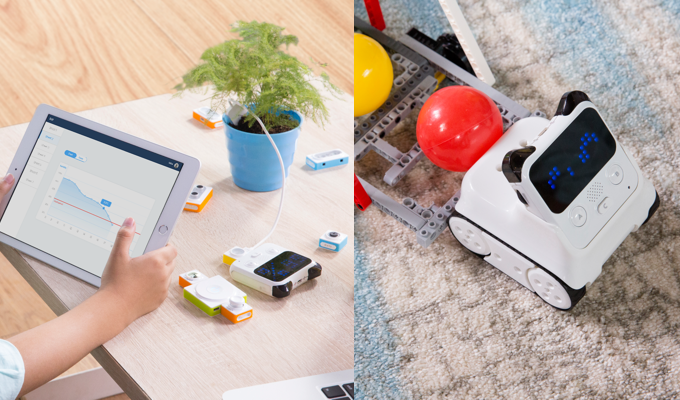 "This is a fantastic little robot and we’d definitely recommend it if you’re after a a coding activity to use with Elementary or Primary students and want something durable, scalable and just plain cute! ‘it’. I would like to buy a Codey Rocky, but I still have some concerns. Q1: Can Codey Rocky connect directly to my phone via Bluetooth? Yes, it connects directly with your phone or iPad via Bluetooth. Q2: What does the Bluetooth Dongle do? The official Bluetooth dongle of Makeblock allows wireless transmission between Codey Rocky and computers. Q3: Does the Bluetooth dongle need to be purchased separately? Yes, it does and Codey Rocky only works with the official Bluetooth dongle of Makeblock.Q4: I have Bluetooth on my computer and mobile phone. Do I still need to buy a Bluetooth dongle? 2. However, the wireless connection between Codey Rocky and a computer requires an official Makeblock Bluetooth adapter, which needs to be purchased separately. Q4: I have Bluetooth on my computer and mobile phone. Do I still need to buy a Bluetooth dongle? Q5: Does it support online debugging? Do I need to upload my programs first before Codey Rocky can run them? Currently Codey Rocky will only run your programs after they have been written and uploaded to the device. Q6: Is Codey Rocky controlled with Scratch? Does it recognize people's faces? 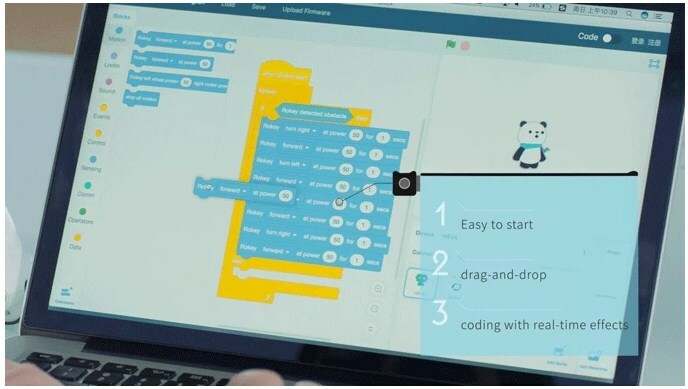 Supported by mBlock 5, which is developed on the basis of Scratch 3.0, not only does Codey Rocky allow you to code in building blocks but also in Python after switching with just one click. It features AI technologies such as face and voice recognition as well as deep learning. Q7: Does the coding software need to be purchased? 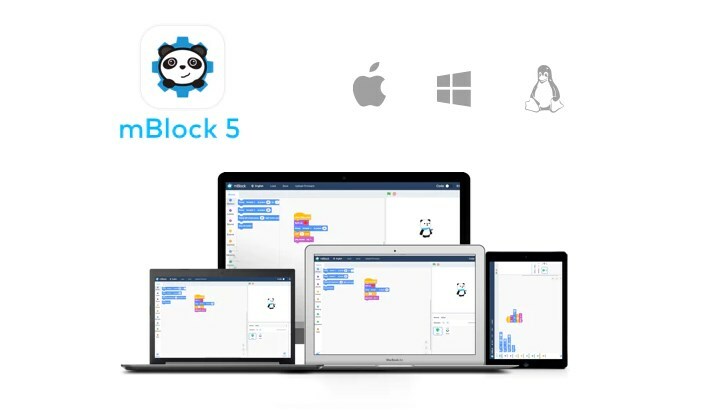 Bundled with Codey Rocky are mBlock 5 programming software and Makeblock App, which are code learning software developed by Makeblock; no separate purchase is required. Q8: Can Rocky operate without Codey? Rocky is the carriage which takes Codey wherever it goes and will only operate when Codey sits on it. Q9: How long will Codey Rocky operate when it is fully charged? It will operate for 2 hours when fully charged. Q10: Will previously purchased Makeblock sensors work with Codey Rocky? Codey Rocky has a variety of built-in sensors, which are sufficient to meet all the basic creative requirements. 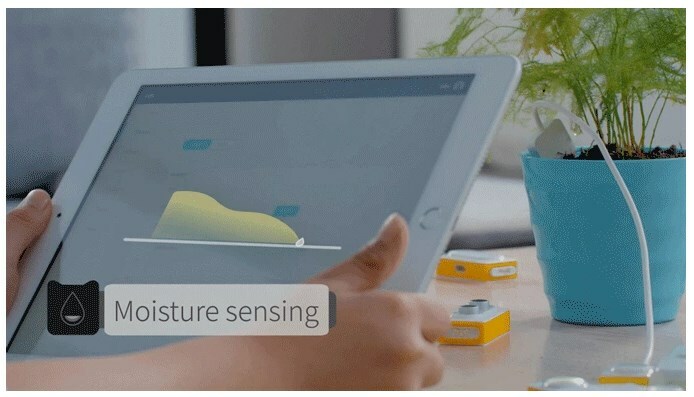 Compatible with the Makeblock Neuron, an electronic building block platform, Codey Rocky can have its functions expanded with Makeblock Neuron; however, other sensors are not supported. Q11: Does Codey Rocky come only in white? Currently it comes only in white. Q12: Does any warranty come with Codey Rocky? How long is the warranty period? Others (color card, sling, etc.) > No applicable to this Limited Warranty. Makeblock only replaces the defective parts upon receiving. I have purchased a Codey Rocky, but I have issues with its use. Q1: I am unable to link it up with the Bluetooth dongle. 2. Press the button on the dongle so that the light on the dongle flashes before lining up Codey close to the dongle. When the blue light on the dongle stops flashing, they will have paired up successfully. Q2: Why does data burning fail? 1. Please ensure that your Codey Rocky is connected to your computer. 3. If none of the above appears to be amiss, try to re-start the software and select an appropriate serial port (if there are several, please try them out one by one). Q3: My laptop computer has a built-in Bluetooth. Can I connect my laptop to a Codey Rocky via its Bluetooth? Codey Rocky connects wirelessly with a computer via the Bluetooth dongle of Makeblock. 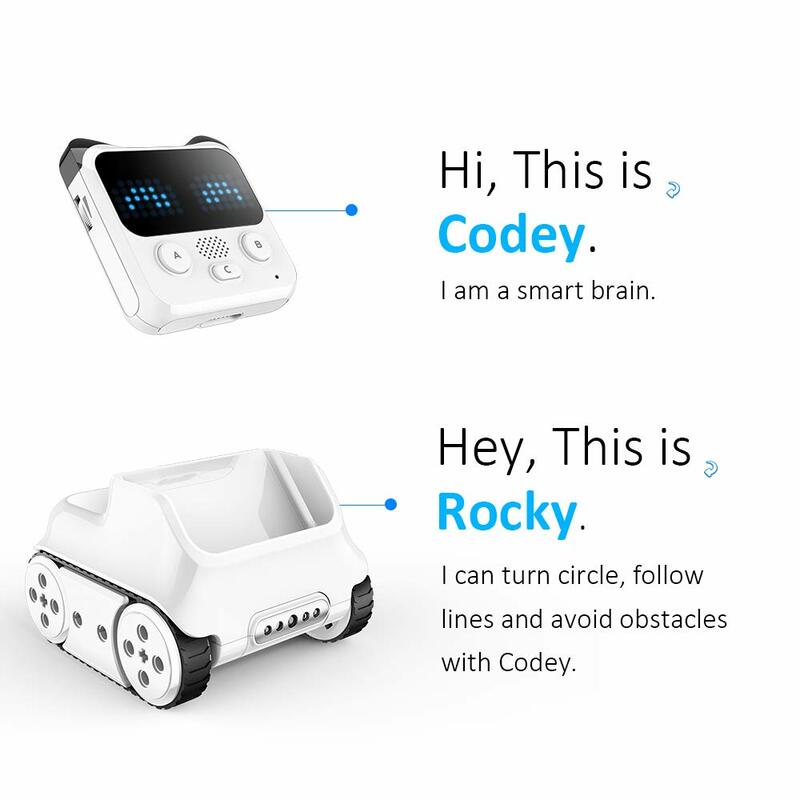 To ensure a good connection, Codey Rocky only supports connection via the Bluetooth dongle it officially recognizes. Mobile devices such as mobile phones and iPads can be connected to via their built-in Bluetooth without a separate Bluetooth dongle. Q4: Does it not support online debugging? Do I need to upload my programs first before Codey Rocky can run them? Q5: Why do I see a blank screen when opening mBlock 5? There could be a problem with the driver of your graphics card, as mBlock requires OpenGL, so a graphics card driver of a lower version may return a blank screen. Please use the driver wizard to update the graphics card driver. Q6: A pop-up error appears saying that the device has not been activated when I clicked to connect the device upon installation of the software. Certain anti-virus and protection software might block mBlock software from connecting to ports. Such protection software should be turned off or disabled when running the alpha version of the software. Q7: Warnings such as those below have appeared: “The version of the driver of your graphics card is too low. Please update your graphics card driver and try again." 1. Please update the driver of your graphics card to the latest version. You may wish to use an updating software similar to a driver wizard, or go to the official website and look for the latest graphics card driver. 2. If everything had worked before, this problem may occur if you open the software immediately upon turning on Codey Rocky, as the operating system has not been fully up and running. Troubleshooting: Reboot the mBlock 5 software. Q8: How to restore Codey Rocky to its factory settings? If Codey is damaged and cannot be restored by updating its firmware, you may try to restore its factory settings. After the software and the device are connected to each other, select the device window below the Stage Area, then click the Settings button in the top right corner of the device field before selecting Restore to Factory Settings. Q9: Why can't the IoT functionality be used? The IoT functionality requires a connection to the Cloud. You need to register an account with mBlock, after which you can log into mBlock and start using the IoT functionality. Registration: Click the round icon in the top right corner of the software. Q10: Would it be possible to engage with Codey Rocky in a conversation? Codey Rocky does not have a voice recognition feature, so a conversation with it is not yet possible. However, voice control is possible if it is bundled with the voice recognition module of Neuron. Q11: Does the voice sensor detect whether there is sound or not? It can detect sound volume.